Health officials announced on Monday that they are launching a cross-country alert for travellers who may have been exposed to measles after a contagious passenger passed through four major airports in the United States. A confirmed case involves a 27-year-old woman, who did not receive immunization against the contagious disease, from New Mexico. Officials said she came from Europe, but was at airports in Colorado, Maryland, New Mexico and Virginia from Feb. 20 to Feb. 22. Other measles cases have not yet emerged. However, health officials from all four states said it is still early since the incubation period of measles takes 10 to 14 days after exposure to the extremely contagious virus. Measles is an airborne virus. It can spread from one person to another. It can also remain in the air up to two hours from the time an infected person coughed or sneezed. Initially, the viral disease resembles a cough, but rashes will soon develop on the face and spread all over the person’s body. 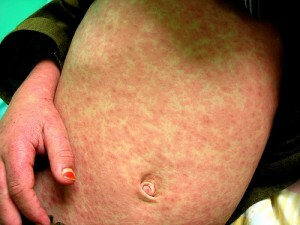 People infected with measles are highly infectious for days before and after the rashes appear. State authorities are trying to get in touch with the passengers who were potentially exposed to the measles case with the help of the Centers for Disease Control and Prevention. Jeff Dimon, CDC spokesman said they are calling to ask if the passengers have already been immunized. Dimon said they are trying to contact hundreds of passengers, which includes passengers seated in the first five rows nearest the confirmed case in one particular flight, and nearly every single traveler on the Southwest flights since they do not allocate seating. Measles have been the leading cause of child mortality in emerging countries. However, it is rarely seen in United States where vaccination is compulsory for all children attending school.